The Fairmont Hotel Macdonald has been an Edmonton landmark since 1915. Lovingly referred to as “The Mac”, the Hotel Macdonald has been a statement of luxury and a host to royalty, political leaders and entertainers alike. The Mac is rich in history and one of the very few places in Edmonton to have a “High Tea” experience. I was delighted to hear that The Mac has brought Edmonton’s very first canine ambassador – “Smudge”. Smudge was in training to be a guide dog for the blind, but was deemed to be too anxious and distracted to continue in the program. Smudge then started her hospitality career. She has been a canine ambassador for the Algonquin in New Brunswick and the St. Andrews in Scotland. When I was invited to the “Mac Festive” event, I was really looking forward to meeting Smudge! Smudge was warm and welcoming with a wagging tail for all! The staff at The Mac is just as warm and welcoming as Smudge. You are always made to feel at home when you visit The Mac. Our event was held in the Confederation Lounge with live music and a crackling fireplace. There was a lovely variety of refreshments offered, but the Pomegranate Poinsettia was so pretty to look at that I couldn’t resist. This was made for me by the bartender and she described all of the ingredients that went into it. Pomegranate juice, vodka and a splash of sparkling white wine. 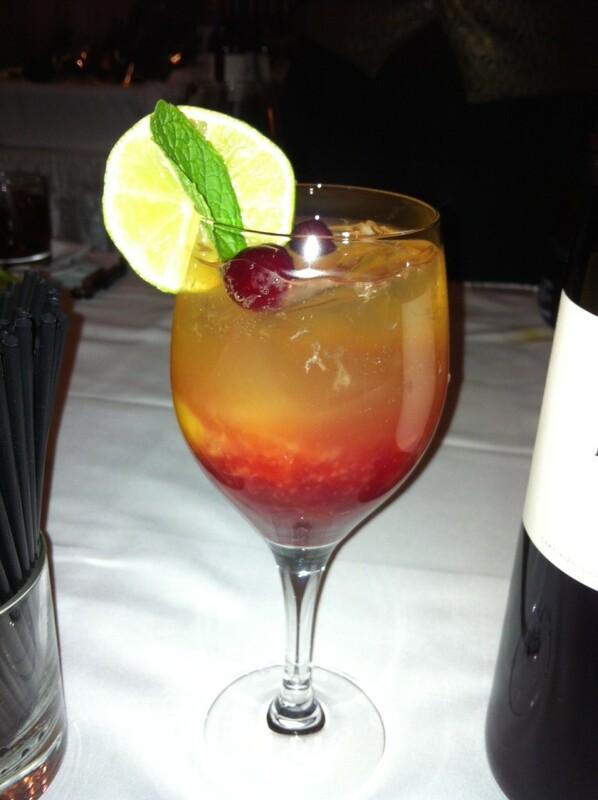 This was garnished with cranberries, a slice of lime and fresh mint. It was very festive and refreshing. Chef Serge Jost was at the Mac Festive event to greet all of the participants and offer them a very tasty lobster bisque with cognac creme . He expressed that he liked to meet all of the media at these events. It was nice to be able to chat with Chef Jost, it gave the experience a more personal touch. He has been with The Mac since the end of August. Welcome to Edmonton Chef Jost, it was lovely to meet you! I was lucky enough to have my two wonderful dining companions; Linda and Teresa. We are most familiar in the Twitterverse and it is always a pleasure to spend time with them. My first tasting plate was the Foie Gras Torchon. Beautiful presentation! This was a great mixture of textures and flavours. The Foie Gras had a silky mouth feel and was my favourite from the evening. 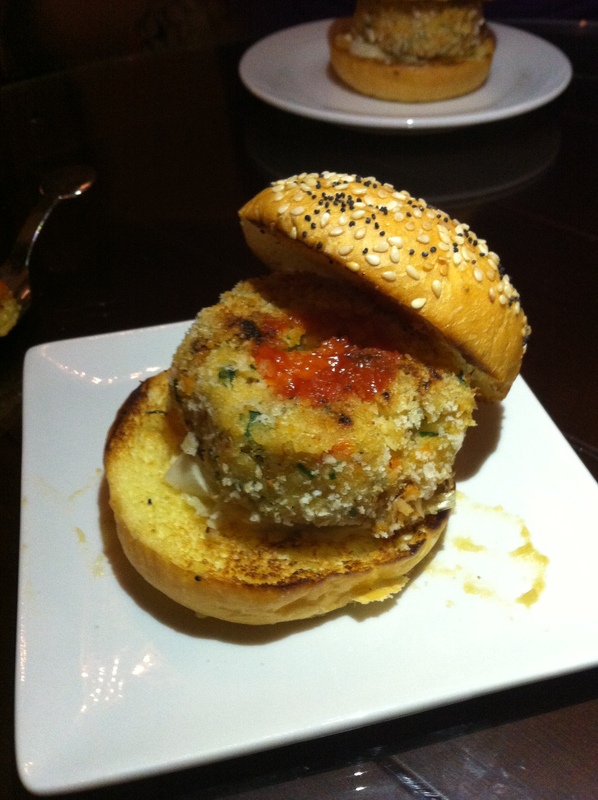 Next up was the Crab Cake Slider. This was served with a miso, fennel slaw and sriracha ketchup. The crab was tender and the coating crispy. The sriracha ketchup gave it a slight kick. Pictured above is Enochi served with spiced squash puree and crispy sage. Again, a lovely marriage of textures and flavours. Above is the house-cured Steelhead Trout served on a Quinoa Bellini. I am a huge salmon fan. This was a nice change in flavour. I was lucky growing up to be very acquainted with the flavours of wild meat. However, I did not learn how to cook it properly until well into adulthood. Besides the beautiful presentation, the meat was moist and flavourful. And to finish the evening off, a selection of desserts. Here we have from left to right the Cherry Shortbread, the Ice Wine Gelee and Candy Cane Fudge. My favourite was the Ice Wine Gelee. Crème Brulee and Panna Cotta are two quick ways to my heart. The Crème Brulee above was Eggnog served with a gingerbread madeleine. This dessert was absolutely breathtaking! Perfect texture and the eggnog flavour married to the gingerbread madeleine – a marriage made in heaven! If you would like to experience a truly wonderful culinary experience with your family or your loved ones, the Hotel Macdonald is always a sure bet! The service is top notch and always welcoming. The environment is comfortable and luxurious. Chef Jost and his team are creative and try to locally source ingredients wherever possible. His French influence adds delicious twists to the food that is presented on all of the menus. The Mac has many different festive holiday options available. Please visit their website for more information. Many thanks to The Mac and their team for another wonderful tasting experience!